There are no accidents in creating great content. But if you ask 100 great content creators, no two will tell you the same way to create something viral. That’s fascinating. How is there not a formula? But it’s not absolute like two parts hydrogen, one part water. It’s more like a recipe for banana Nutella crepes. There are 20 different ways you can make them to fit different tastes. You can add mint or strawberries, you can make them gluten-free, sugar-free, or vegan. Still, the base always remains the same. You need flour, eggs, and butter (or an equivalent substitute). The same is true for content. People need to be able to see your content for it to spread. Create it with timing in mind. You can’t plan for most trending topics but there are certain moments and events that can be anticipated. For content that takes a long time to produce, having an idea of what will be trending a month out is vital. Last month, I would have been planning something Star Wars related. This month, I would be planning something about how much we hate winter. Global Warming can’t save us forever. Winter is coming. I can’t stress how important a network is. Find 50 influential people to share your content at the same time and you can almost always create viral content. It really is that simple if you know the right people and how to ask. I’ll save that for another piece. How is that for a tease? There’s no one on earth that understands building a network better than designer Cyrene Quiamco, who goes by CyreneQ. Cosmopolitan featured her as one of the Internet’s Most Fascinating People. On Snapchat, she can charge $10,000 per Snap. She has found a way to build a network on a platform not built for networking. CyreneQ breaks down Snapchat: “Snapchat is a closed platform, there’s no user suggestion page and it’s difficult to discover user-generated content within the app. 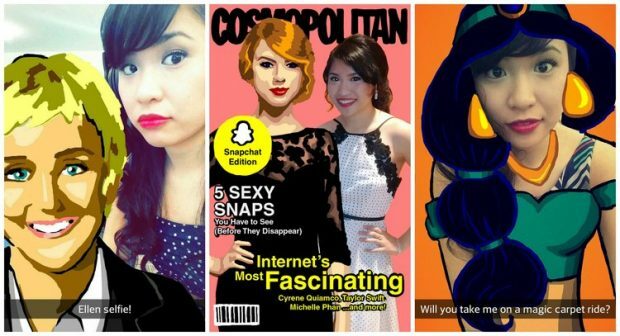 How can content even go viral on Snapchat? Unless you are a celebrity or famous somewhere else and you drive your audience to your Snapchat account, it seems impossible to grow an audience on Snapchat. “I’m one of the few homegrown Snapchatters that grew my following solely on Snapchat. The key to going ‘viral’ on Snapchat is collaboration and expanding your reach through word of mouth—shoutout for shoutout. “But then you go back and ask, how and where do I find people to collaborate with? I created a website called The11thSecond.com. The website is an extension of the Snapchat experience, hence why it’s called the 11th second, after the 10-second Snapchats disappear. It’s a place where Snapchatters can discover and connect with the content creators via a directory of Snapchat usernames and BooR codes. The11thSecond.com is not only a username directory, but also showcases saved-out content from the creators to serve as inspiration to other aspiring creators. Sarah Cooper created one of my favorite videos, Decembeaver, as a follow-up to Movember. Within seconds you get the joke, the female perspective on unruly facial hair and you are instantly compelled to share it. Just as important as the network is the reason why someone should share your content. If you can elicit an emotion, you are far likelier to get your content shared. Make people passionate about your content. “From my experience, content that people can relate to always has a greater chance of success. When people can look at something and say, ‘this is SO me,’ or ‘this is SO you’ they have a greater desire to share it and talk about it. I think content promotion on blogs and publications is really important, too, but things don’t really go viral unless individuals take the next step and share it with all their friends,” said Cooper.